The Beatles 50 Years Ago Today: July 7, 1967. Beatles Radio: The Beatles, Solos, Covers, Birthdays, News The Fab 4 and More! The Beatles' 15th UK single, All You Need Is Love, was rush-released in the wake of the Our World satellite broadcast. 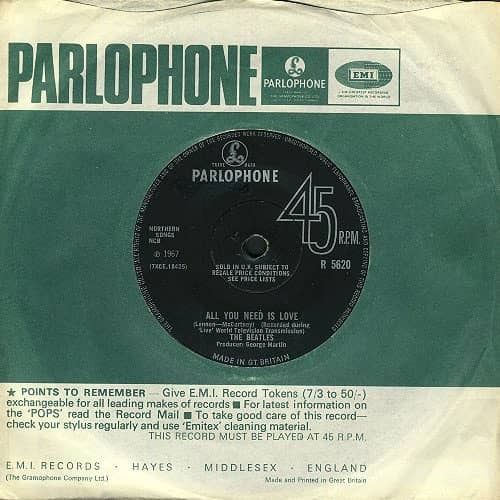 It was issued as Parlophone R 5620, on mono only. Remarkably, it was the first Beatles single to carry a producer credit for George Martin. The b-side was Baby You're A Rich Man. All You Need Is Love was, predictably, a smash hit, both in the UK and around the world. Five days after its release it was at number one in the charts, where it remained for four weeks. In all it spent 13 weeks in the charts.